Star Wars: The Force Awakens has opened in movie theaters with much fanfare. Moviegoers dressed as characters in the film lined up expectantly to watch the timeless galactic tale of good versus evil. Among other places, the space saga played under the gaze of real space shuttles and aviation history in the IMAX movie theater of the Air and Space Museum in the heart of the U.S. capital. And though IMAX and 3D technology dramatically add to the space opera’s movie viewing experience, the real Force is in a story that has captivated generations. Still shiver-inducing after 30 plus years, John Williams' score triumphantly announces the beginning of Star Wars: The Force Awakens, and we sense that we are in for another wild ride. The familiar informational scroll informs us that Luke Skywalker has disappeared, pursued by the evil First Order. A new Resistance, led by General Leia Organa, formerly Princess Leia, played by a naturally aging Carrie Fisher, is once again the lynchpin in the galaxy's fight against evil. The text scroll fades into the background, giving way to a haunting white planet as it is eclipsed by a massive, menacing black spacecraft. Tie fighters pour out of the mothership in time with Williams' score, an elegant opening to the world's epic space opera. 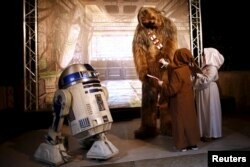 Characters of Star Wars take part in an event held for the release of the film "Star Wars: The Force Awakens" in Disneyland Paris in Marne-la-Vallee, France, December 16, 2015. First Order fighters land and open fire on a village, searching for the map that will reveal Luke Skywalker’s location. Legend has it he is alive, vanished to the edge of the galaxy after training Jedi soldiers. The First Order, the new evil in the footsteps of the Galactic Empire, is out to get him before the new Resistance can. And so the plot, written and directed by George Lucas' most avid student, J.J. Abrams, takes off. Director J.J. Abrams (C), cast members John Boyega (L), Daisy Ridley (3rd L), Adam Driver (4th R) and Star Wars character R2-D2 (2nd L), stormtroopers, and BB-8 (4th L) attend a fan event for "Star Wars: The Force Awakens" in Tokyo, Japan. Abrams co-wrote the script with Lawrence Kasdan and Michael Arndt. Kasdan and Arndt are the team responsible for The Empire Strikes Back and Return of the Jedi, as well as Steven Spielberg’s Raiders of the Lost Ark. So, it's no surprise this film contains some of that Indiana Jones fairy tale energy and action. In Star Wars: The Force Awakens, Abrams follows the already successful template from his Star Trek movies, mixing iconic characters with charismatic new ones, who will eventually carry this new franchise to box office greatness. Three new main characters pull us in with their Generation Z sensibilities. Daisy Ridley plays Rey, an unpretentious, tough young woman, a great fighter, pilot and mechanic. BB-8 droid poses with actors and director during a press conference for their latest film "Star Wars: The Force Awakens" at a hotel in Urayasu, near Tokyo, Dec. 11, 2015. Totally self-reliant, she scavenges old ship parts and trades them. She doesn't know anything about her family, though she hopes to be reunited with them some day. She also doesn't know, yet, that the Force is strong within her. She stumbles on renegade storm trooper Finn and the two join forces to protect the tiny robot BB-8. The robot is hiding the information on Luke Skywalker’s whereabouts and set out on a quest to deliver it to the Resistance. John Boyega grows into the role of Finn, the unwitting hero, starting as a fearful but kind-hearted storm trooper with a conscience, running away from the atrocities of The First Order. While Rey and Finn are clearly our new heroes, there is always the Dark Side. Kylo Ren, played by Adam Driver with a black mask, cape and distorted vocals reminiscent of Darth Vader, is an anti-hero wannabee with great potential. His expressive face reveals inner pain and hatred; a very intriguing presence who answers to the holographic image of supreme leader Snoke, who looks eerily like a villain from a different galaxy: Voldemort from the Harry Potter series. The three young main characters are anchored in the presence of the iconic leaders who light up the large screen and bridge the old with the new. Although time may have ravaged the stunning good looks of Harrison Ford, it has not dented his Han Solo devil-may-care attitude, youthful spontaneity and constant companion, a seemingly ageless Chewbacca. Carrie Fisher is rather wooden as General Leia, reminding us how acting has improved over the decades. But who can question an icon? That goes as well for Mark Hamill as Luke Skywalker ... no spoilers here. Oscar-winning Lupita Ny’ongo is unrecognizable as Maz Kanata, an enlightened diminutive alien, who might evolve into a Yoda-esque dispenser of wisdom. Rising star Oscar Isaac is Resistance pilot Poe Dameron and Domhnall Gleeson offers a chilling performance as First Order General Hux, who — in front of thousands of troops — delivers a speech no doubt purposefully reminiscent of Hitler’s 1934 Nuremberg rally. A screen grab from the preview of for 'Star Wars: The Force Awakens,' the next installment of the "Star Wars'' film franchise. The casting is well done, with the new kids holding their own alongside the iconic Star Wars characters. But some fans have been fans since 1977, and it will be hard for any film to surpass what has become a cherished childhood memory for millions. Despite its clear power, Star Wars: The Force Awakens isn't a masterpiece. It is a good action film that respects the saga that came before. It takes a strong story and adds 30 years of advanced CGI and 3-D IMAX imaging to bring imaginary worlds, fight scenes in air and space and superbly choreographed light-saber battles to glorious life. However, this first of the renewed franchise seems to lack the mysticism infused by Star Wars father George Lucas in the old trilogy. Rather it feels like the harbinger of better things to come. It certainly whets our appetite, leaving questions unanswered and emotionally charged by larger-than-life heroes. Ultimately, it is no small compliment to say that Star Wars: The Force Awakens lives up to our expectations, which were very high indeed.